In this section, we will go back to the SALES data set we worked on in the beginning. We will build an ARIMA model to forecast the total sales based on the sales record over the 60-day period. We will first use the ARIMA procedure to check whether there is autocorrelation in the time series. From the descriptive statistics, we see that there are 63 observations in the SALES3 data set with three missing values. The average daily sales is around $300 with a standard deviation of 88.85. 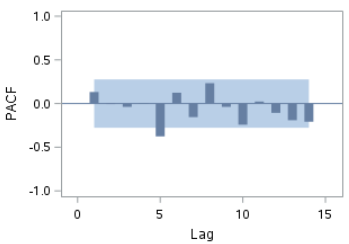 The p-values from the Ljung-box test are above 0.05 at lag 6 and 12. Since the time series does not show any systematic pattern, we could simply assume the daily sales resolves around $300 with a standard deviation of $88.85. The future daily sales are predicted to be $300 for the foreseeable future. This is the same as fitting an ARIMA (0 0 0) model to the data with no differencing, AR or MA term. The parameter estimate for µ (mean) is $300.83. The AIC and SBC are 710.7096 and 712.8039, respectively. Scroll down to the bottom of the output. ​The MAE and RMSE are 49.53 and 60.46, respectively. Are we done? Can we get a better model? You can see that some residuals are fairly large. 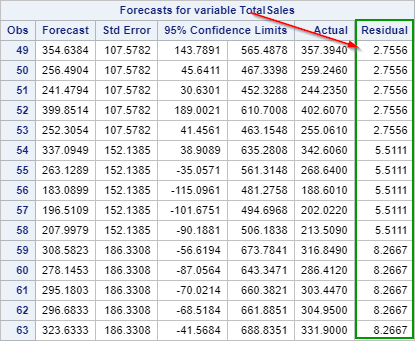 Maybe there is a model that does a better job in the sales forecast. In section 2, we have learned that Monday's sales are substantially higher than the rest of the week. We can model this seasonal spike by having a seasonal differencing of 5 days. Adding a seasonal differencing of 5 days to the model will change the outlook of the ACF and PACF plots. Let's look at the tables generated. 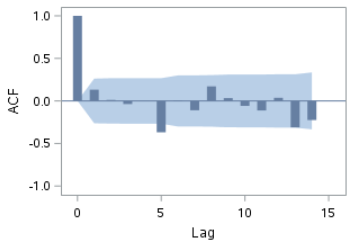 Both plots show a spike at lag 5. However, based on the Ljung-box test, we cannot reject the null hypothesis that the residuals are white noise. The AIC and SBC are 635.0945 and 634.0457, respectively. These are much lower (better) than the earlier model where AIC=710.7096 and SBC=712.8039. Again, scroll to the very bottom. The MAE and RMSE are much lower! They are now at 5.51 and 5.95 as opposed to 49.53 and 60.46 from the earlier model. ​The residuals also look great! The residuals are mostly under 10. 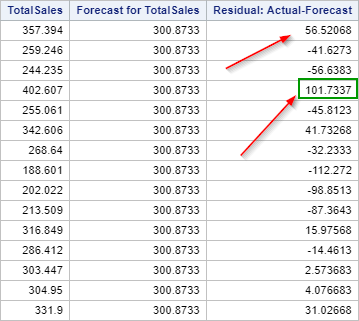 The sales forecast is off by less than 10 at each of the time points. Note: the residuals look too clean to be real. We suspect the sales data set might have been systematically generated, as opposed to being obtained as an actual sales record of a business. Done! The ARIMA model we have identified is the Seasonal ARIMA (0 0 0) (0 1 0)​5.